I had been wondering what had happened to Marco Rubio since he helped Texas Senator Ted Cruz throw gasoline on the Republican Party’s fast-shrinking “big tent” and set it ablaze. I know, he really just wanted to blow up the US government and maybe the entire economy as well, but the biggest casualty of this disastrous game now is pretty clearly the GOP itself. The latest polls released on October 10 shook political Washington like an earthquake, showing public blame for the government shutdown and threatened financial catastrophe landing squarely where it belongs—on the Republican party—and popular support for the GOP at a historic low. Suddenly, John Boehner and Eric Cantor stopped making hypocritical claims about how it was all really President Obama’s fault and seemed to realize that they were playing a bad hand that Ted Cruz and his groupies like Rubio had dealt them. Through it all, the bad boys who set the blaze were oddly absent from the scene. Rubio, in particular, has been AWOL and appeared to be avoiding the media, which seemed to have forgotten about his role in creating this ridiculous crisis. Media attention focused on the adverse impact of the Republicans’ self-immolation on Cruz’s political ambitions, and on the abrupt plunge in support for Cruz’s other acolyte, Senator Mike Lee, in his home state of Utah (! ), where it turns out the federal government is by far the largest employer. I thought maybe Rubio had become the artful dodger and—realizing this was not a good time to be seen carrying around explosives–had decided to try to put some distance between himself and Cruz’s Tea Party Crew. But it appears that is not the case. 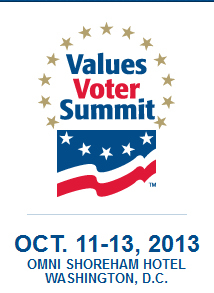 Today, Marco Rubio is a featured speaker at the Values Voter Summit as it convenes in Washington, DC. The line-up of speakers is a virtual Who’s Who of the Tea Party luminaries who engineered the sorry spectacle we have been witnessing: Ted Cruz, Ed Meese, Jim DeMint, Rand Paul, Glenn Beck, Michelle Bachmann, Louie Gohmert, even crazy Allen West—the list goes on and on. So it would appear that Marco Rubio has indeed gone all in with the gang most responsible for creating this unspeakable mess. In case you’re not familiar with the Values Voter Summit, it was developed as a political vehicle for ultra-conservative Christian organizations like the Family Research Council to influence the political arena and the Republican Party in particular. It has become a rival forum to the Conservative Political Action Committee (CPAC) after the latter in 2011 included the gay Republican group GOProud and the anti-gay religious groups walked out. Now it is a virtual Tea Party convention. This year’s speaker roster includes Brian Brown, President of the National Organization for Marriage, who has been advising Vladimir Putin and the Russian parliament on anti-gay legislation in Russia. Maybe it’s just me, but I think this could be a window of real vulnerability for Marco Rubio. If I were on the Florida Democratic Committee, I would be commissioning TV and print ads holding Rubio accountable for his role in creating the shutdown crisis and highlighting the extremist views of the political company he’s keeping, which indeed appear identical to Rubio’s own views. I know it’s a long time until he’s up for re-election and voters have poor memories, but now is the time to brand him with the responsibility for his actions when the public is receptive to that message. I’ll even draft the bumper sticker: SHUT DOWN MARCO RUBIO! I’d gladly put one on my car! The Values Voter Summit held its presidential straw poll as usual, and unsurprisingly Ted Cruz blew away the field with 42 percent of the votes. Marco Rubio finished far back in the field at number five, with only 5 percent of the votes. Looks he will need to start hustling just to keep his gig as Cruz’s warm-up act. Must be tough to be thrown over for the likes of Mike Lee. Yes, they’ve shut down the government while we are at war in Afghanistan. The Tea Party is now partnered with nobody but the Taliban. « Is Ros-Lehtinen Beatable Now?